At least 15 persons were injured when gas cylinder in a welding shop blew up in Rally village of Atreyapuram mandal on Wednesday. According to police, a blast took place in a gas welding shop in the town. When the people rushed to see what happened, another explosion took place as the flames from the first blast triggered another blast involving another cylinder. Fifteen people suffered burns in the incident and all of them were rushed to Rajamahendravaram government hospital.Home minister N Chinarajappa and Legislative Council Deputy Chairperson Reddy Subrahmanyam visited the hospital and asked the hospital superintendent Dr Ramesh Kishore to shift three persons whose condition was serious to Kakinada government hospital. 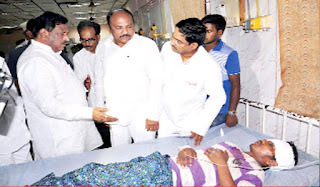 The trio, identified as P Suresh (16), K Anand (21) and Kumari (28), were shifted to Kakinada government hospital.